It used to be the bride in white and the groom in a tux, a pretty punch bowl, a little rice, and you had a decent wedding. But weddings have gotten a little more exotic. Exotic in the sense that you might want to consider a llama or two. Perhaps an elephant if you really want to have good luck and matrimonial bliss, as one man did in Las Vegas. In Las Vegas anything pretty much goes, but this is a little more than anything goes. A groom of Indian descent rode on top of an elephant in front of the Bellagio hotel. Accompanying him was a small gathering of 10,000 people. They danced around Tai the elephant who weighed in at about 4.5 tons. The theory is the elephant brings good luck. "Elephants cost $10,000 to bring to Las Vegas, exotic animals make for a high-end wedding because they're hard to get approval or to be able to make them come to the middle of the desert," said wedding planner Tory Cooper. If you think $10,000 is a bit steep, the insurance is no walk down the aisle either. The Bellagio required Tai's owner to have a multimillion-dollar insurance policy before the elephant was allowed on site. Not only that, but any animal that is used in a wedding has to be licensed and monitored by the feds. There are lots of rules for the owners of these exotic animals. They have to file a travel itinerary and make sure at all times there is enough distance between the animal and the public. As big as elephants are, sometimes smaller can be just as memorable. Butterflies are also a trend at weddings lately. They like to release them after vows are said. At ButterflyRelease.com, pricing ranges from $50-$400, depending on how many butterflies you want in your ceremony. But if you are a DIY type, you can get a grow-it-yourself box for $20. It's not just weddings. Proposals are also including animals. Kyle Guthro asked his penguin-crazed girlfriend, Kelly, to marry him at the Newport Aquarium near Cincinnati, which actually has a “penguin proposal” package for $349. The aquarium averages about two wedding proposals a month. 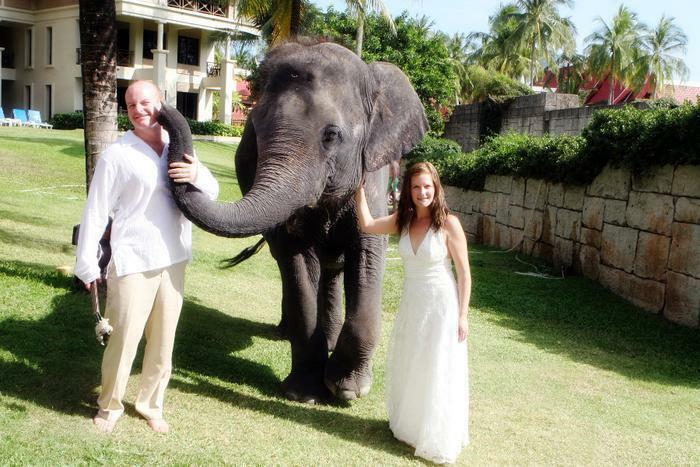 If after you have read this you feel you must have an elephant at your wedding or engagement party check out this site. Having an elephant is something you and your guests will never forget and neither will the elephant, which may not be a good thing. Animal rights activists take a dim view of all of this and, for all we know, so do the elephants. Why are fewer and fewer people getting married these days?